Pilot Andre Borschberg eased the Solar Impulse onto the runway at Payerne airfield about 30 miles (50 kilometers) southwest of the Swiss capital Bern at exactly 9 a.m. (0700 GMT; 3 a.m. EDT) Thursday. Helpers rushed to stabilize the pioneering plane as it touched down, ensuring that its massive 207-foot (63-meter) wingspan didn't scrape the ground and topple the craft. The record feat completes seven years of planning and brings the Swiss-led project one step closer to its goal of circling the globe using only energy from the sun. "We achieved more than we wanted. 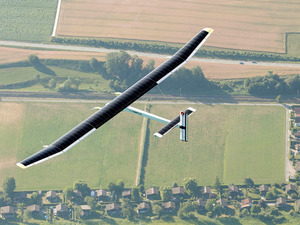 Everybody is extremely happy," Borschberg told reporters after landing. Previous flights included a brief "flea hop" and a longer airborne test earlier this year, but this week's attempt was described as a "milestone" by the team. The team says it has now demonstrated that the single-seat plane can theoretically stay in the air indefinitely, recharging its depleted batteries using 12,000 solar cells and nothing but the rays of the sun during the day.